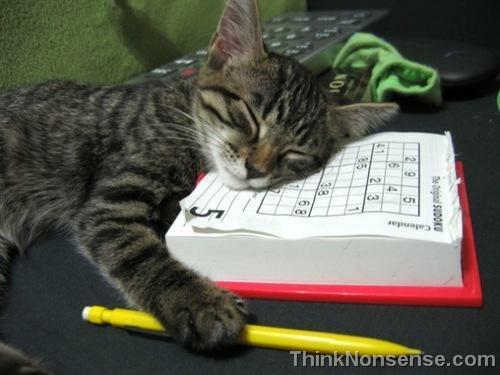 Sudoku is a terrible dream for a maths phobic person. And can be for others also. I tried to solve that 9×9. I never got success. There are being book written on “Hot to solve Sudoku”. Don’t they have any other thing to do. Write a book on nonsense. You’ll get one reader at least in the form of myself. The craze of Sudoku is at it’s peak level. I find it everywhere. It is started on newspapers. Then as a widget on blogs and websites. There are dedicated websites for the Sudoku. It is found in almost all games section of any website you surf. It’s annoying when you find the same thing everywhere. But there is one thing. I’ll learn Sudoku one day. May be I’ll be able to solve it without any help. Who knows I may start liking it.. Funny, I even wrote a program to generate and solve sudokus Well, it’s not THAT hard to only understand how to solve them I think.